I've been busy all week getting ready for the big trip to Alaska. I've been breaking in my hiking boots for the last two weeks, and I'm about to spray my clothing with a super long lasting insect repellant. I will be camping the entire time there, except for the 3 days in Anchorage. My trip will be with a dozen or so other people, and I'll even be sharing a tent with someone else who's crazy enough to go to Alaska alone. If this sounds like the most anti-Jim thing I could possibly do, you would be correct. Which is exactly why I'm doing it! We cross the Kenai Peninsula this morning to Seward. This afternoon we can hike at Exit Glacier. A free day in the Seward area. You can take an optional scenic cruise or flight into Kenai Fjords, hike to the Harding Icefield or go on an ocean fishing charter. North from Seward we'll visit Portage Glacier then on to Whittier for a six hour ferry cruise across Prince William Sound, to Valdez. Along the way we will see the massive Columbia Glacier. Numerous hiking options are available today. Short raft or kayak options are also available. 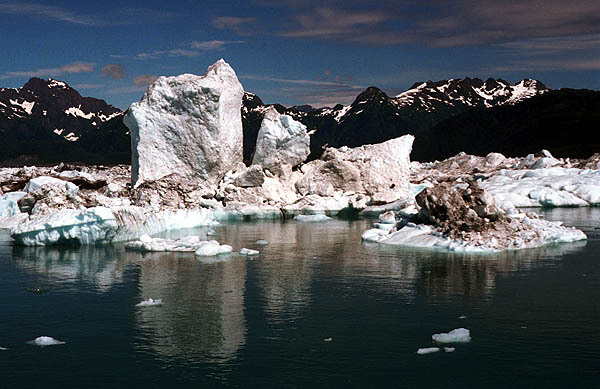 Or travel by boat to spend the day kayaking by the face of Shoup Glacier. In the evening we travel by float plane across the Eastern side of Prince William Sound to Cordova. We'll explore the Copper River delta, traveling the 45 mile Copper River Highway. Along the way we travel through nesting areas for migratory waterfowl. At the end of the road, the Childs Glacier meets with the Copper River. The constant calving of the glacier is a spectacular sight. We'll spend most of the day in the Cordova area. There are numerous trails in Chugach National Forest. Late in the afternoon we'll fly across Prince William Sound, returning to Anchorage. North through the Matanuska Valley for three nights at Denali National Park. On to Fairbanks, with the afternoon free to see the University Museum, shopping for native crafts and sightseeing in Alaska's second city. Through the White Mountains, hike on Summit trail, and on to Manley Hot Springs. Don't expect a resort, instead you'll find the essence of Alaska in this interesting 'end of the road' town. Here we'll experience Alaskan culture by visiting an active dog team kennel, or an optional boat tour to a fish camp on the Tanana River, and of course, soaking in the hot springs. Following the pipeline north, we cross the Arctic Circle to camp and hike in the foothills of the Brooks Range. Across the Atigun Pass to the coastal plain of the Arctic. Camp in the tundra wilderness of the north slope. On to the Arctic Ocean, we'll tour the Prudhoe Bay oil complex then fly to Anchorage this evening. More from the archive in Me.